112. 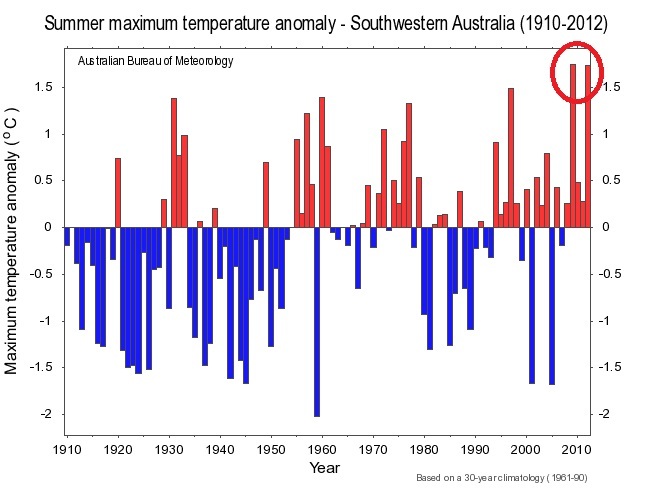 Not the 700+ of the AWAP (Australian Water Availability Project) used to make the claim about January 7 being the hottest day on record. 112 is the number of sites in the ACORN dataset. 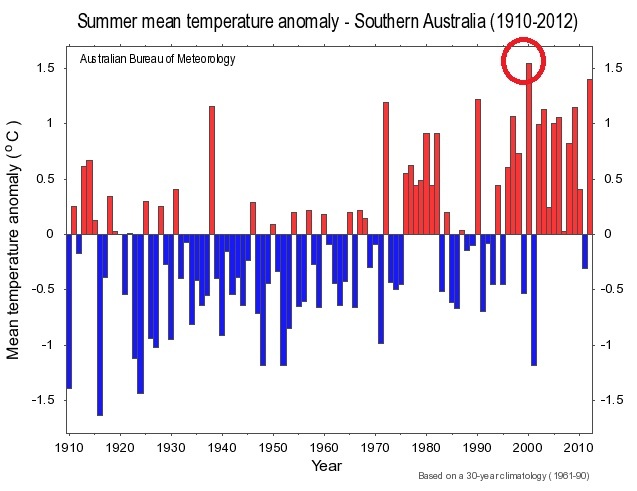 So I’m sure all journalists reporting this claim would have referred to the BOM’s Time Series Graphs on their website, which use the ACORN data, to confirm just where this summer was the hottest on record. Forgive the sarcasm- they plainly didn’t. Let’s take a look. 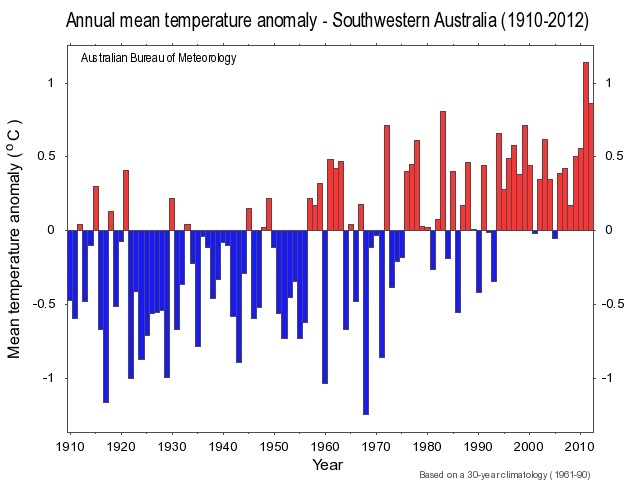 First, here is the plot for the summer mean temperatures for all of Australia 1910-2012 (which includes January and February 2013): Yep, the 2012-13 summer mean was definitely the highest on (this) record. 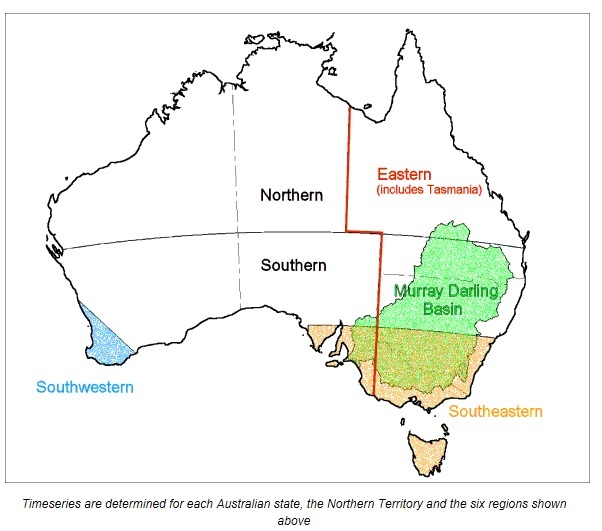 There are 6 regions and 7 states/territories in Australia: Let’s see how each of these performed. 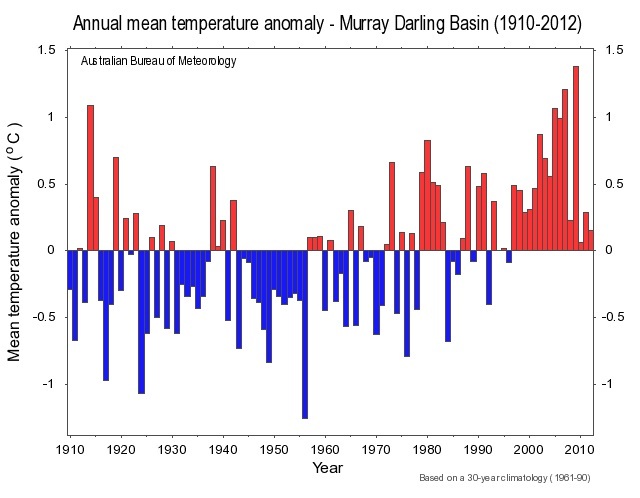 Eastern Australia: South Western Australia: South Eastern Australia: Murray-Darling Basin: What’s going on? 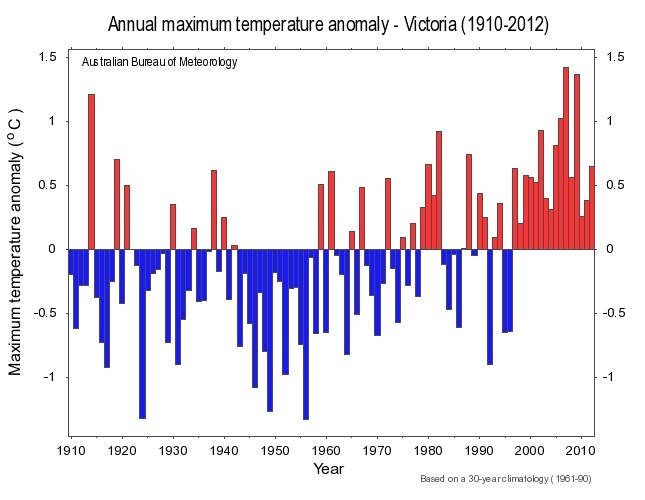 I am reminded that one way of calculating mean temperature is to average the minimum and the maximum. 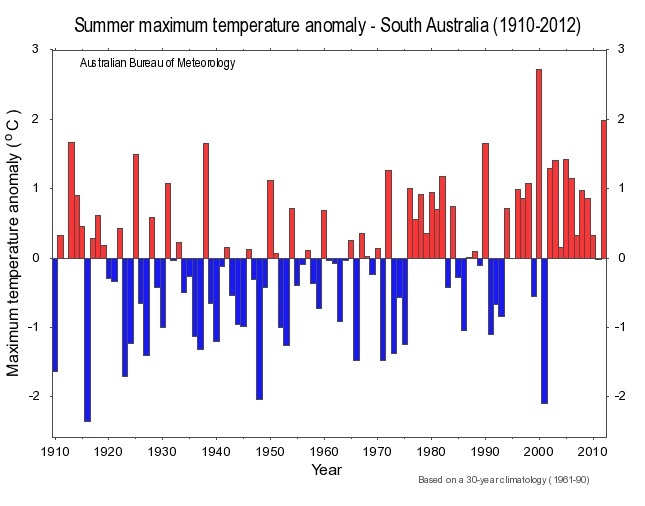 Here’s the summer maximum for Australia: As expected. 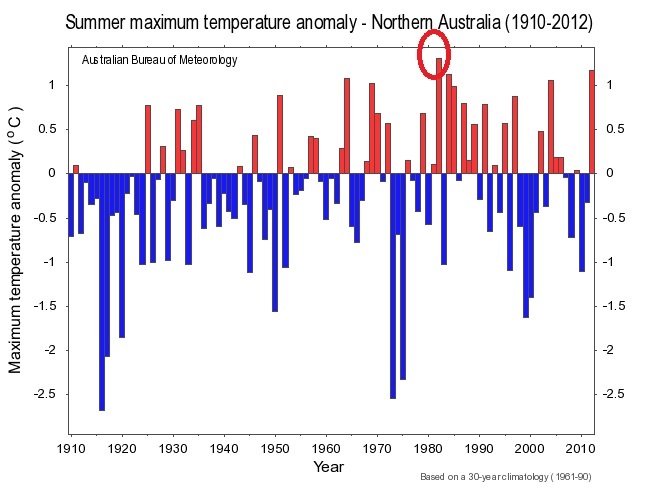 Now the minimum: So we can blame the record mean on the record maximum temperatures. Let’s look at the different regions. Not Northern Australia. It’s Southern Australia: But not Eastern Australia. Not South Western Australia. 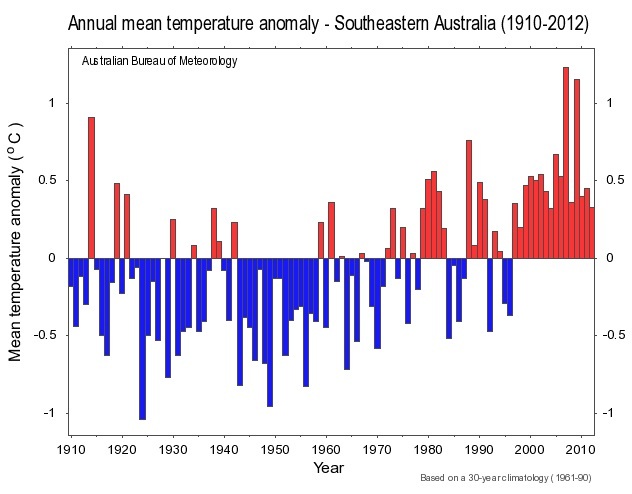 Not South Australia (the State): Not Western Australia (the State): So the only part of Australia left that could be responsible for the summer maximum record, and consequently the mean, is this bottom part of WA not in the south west corner, or perhaps as well the southern portion of Queensland: It must have been a tad warmer than average there! 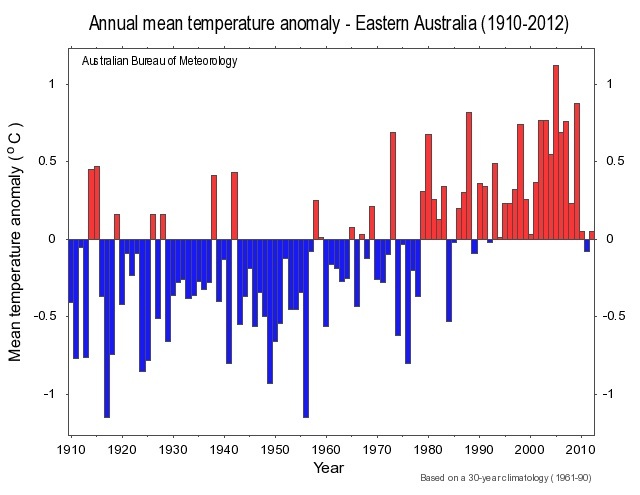 The summer mean temperature for all of Australia, according to BOM, was the highest on record. They confirm this with their graph of ACORN data. 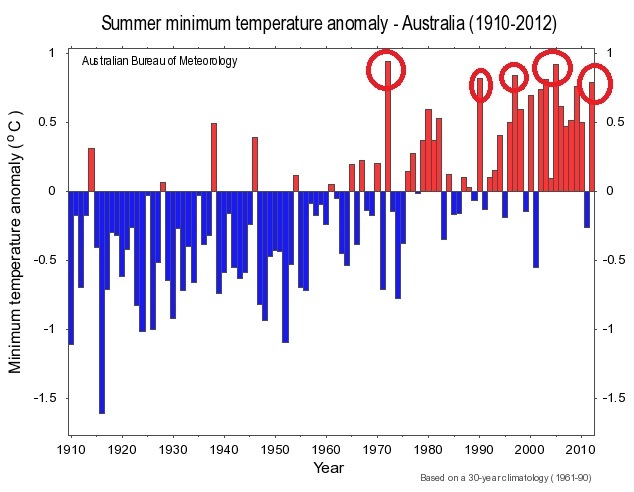 The summer minimum was not a record by a long way. 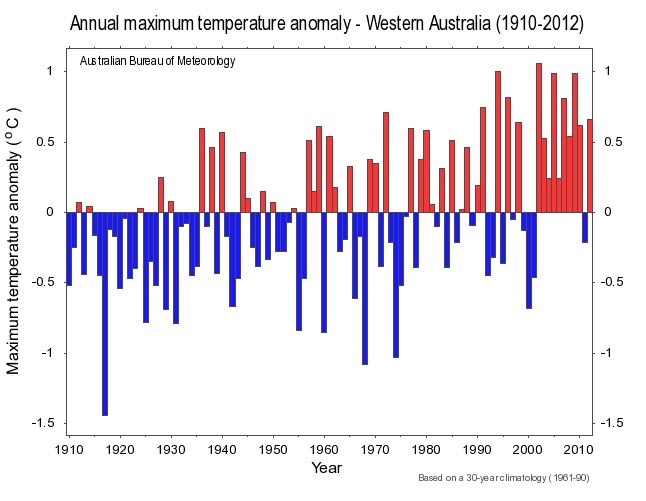 Only Southern Australia’s maximum temperatures show this record. No other regions were hotter this summer. And this includes none of the smaller regions within Southern Australia. 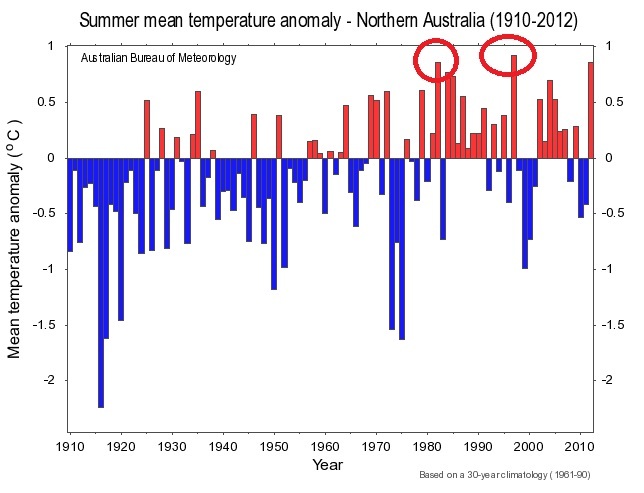 Therefore we can conclude that BOM is flicking between two methods of calculating temperature and two datasets to find the “record” that fits their global warming mantra. This entry was posted on March 3, 2013 at 1:31 pm and is filed under climate, temperature. You can follow any responses to this entry through the RSS 2.0 feed. You can leave a response, or trackback from your own site. An example of what you claim – one of the records broken was Walgett, NSW. 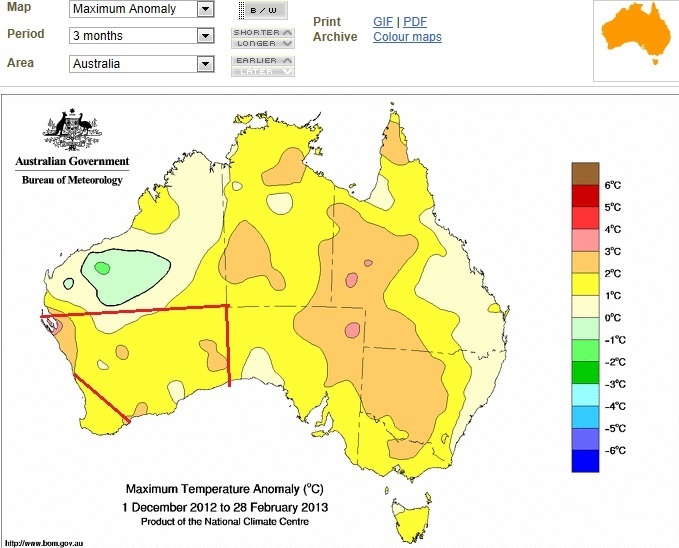 It reached 48.5C in Jan 2013 breaking a 48C in 1973. 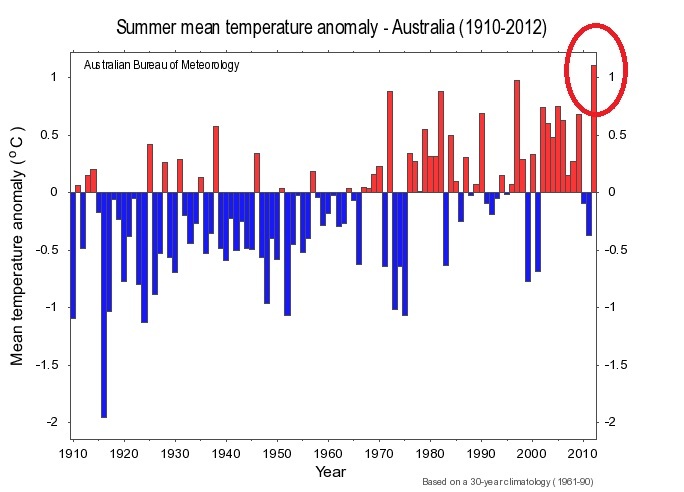 However, according to their own records, Walgett had a 49.2C on 3rd Jan, 1903. What do you make of this? 2009 is now the 3rd warmest year after being 2nd last year (replaced by 1998). Look at the annual summaries (2011 and 2012) now before they are ‘corrected’. Also shows up on the time series graphs. 1998 has risen from 0.73 to 0.85C and 2009 has gone from 0.90C down to 0.81C. Ken, while the actual calculations used by BoM would be more complex the concept is fairly simple. 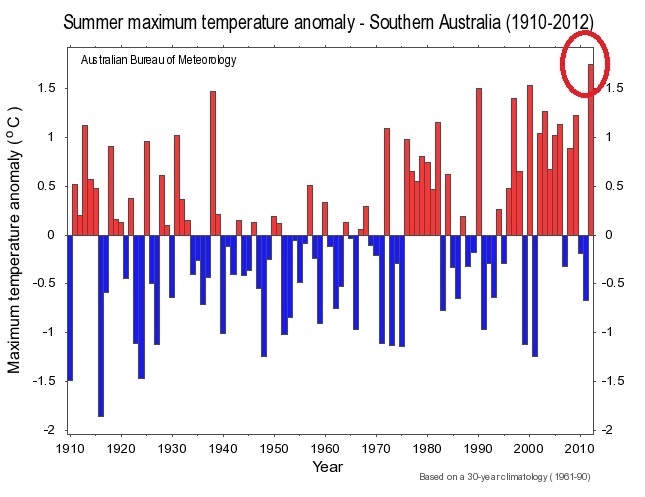 If you look at the summer temperature charts, the highest years you’ve circled have all been different years, so for all Australia the regions with lower summer maxima would have dragged down the Australia-wide. So even though individual regions or states might have been hotter in one or other years, in the same year one state had its hottest year, other states would not have. This time they were all hot at the same time, even if no individual state had a ‘hottest year’ for that state. Hence the hottest year overall. I might not have explained it well. Try using matchsticks of different heights and line them up with the different years – then put all the match sticks in any one year end to end. The longest line is the hottest year. 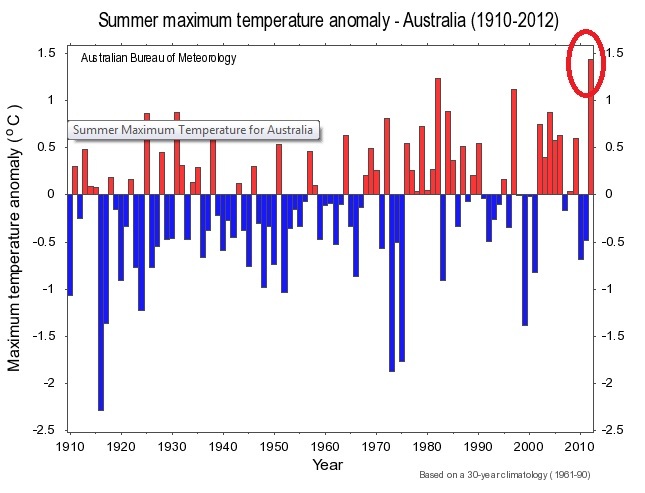 8 + 8 + 7 + 8 = 31 – the hottest year, even though no one number is as high as the 10 in other years. BoM would most likely use smaller sized grids than is available in the summer maxima charts but the principle is the same. 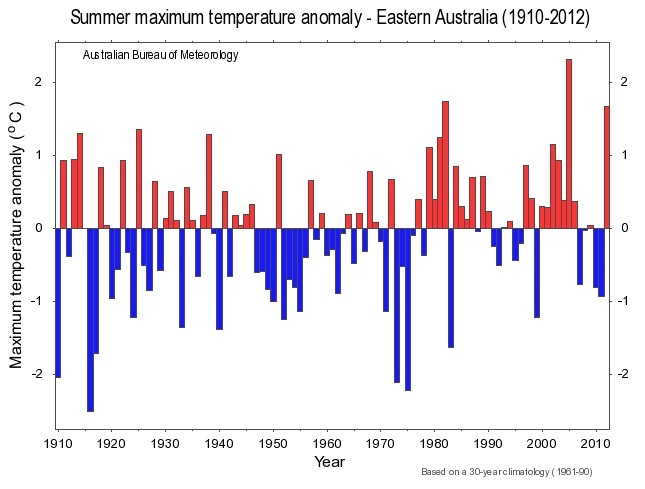 Even just eyeballing the charts, at the very coarse level of State summer maxima, it’s pretty obvious which was the hottest year for the continent overall. Thank you Sou for your polite and reasoned comment. As you are aware from my comments at another site, I agree that it is possible to have a record across the whole without individual component records. The area I highlighted in southern WA is worth watching however. It has a large influence across a wide area (because of the scarcity of stations) and any errors are magnified. Watch this space. Have you ever looked at a temperature chart (map)? That might give you a better understanding of how the Bureau is able to deal with large areas. It’s a bit like a contour map. Similar temperature ranges can spread over very large areas. 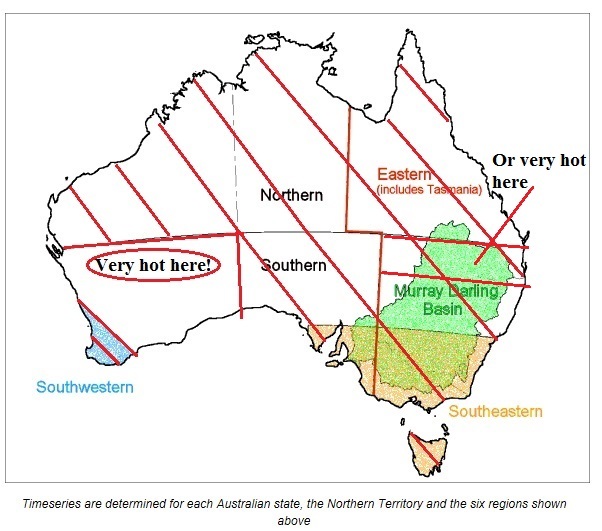 If, it’s hot in Alice Springs and it’s hot in Broome and the Pilbara – it’s likely to be just as hot in between. These days satellites help a lot as well as looking at pressure gradients, rain bands, wind etc. Temperature calculations would be fairly straightforward. Yes Sou, I am quite familiar with them. And a small error in one remote location can therefore “be spread over very large areas”. One of the problems identified by the review of ACORN. I will be posting about this very topic in a few weeks’ time.